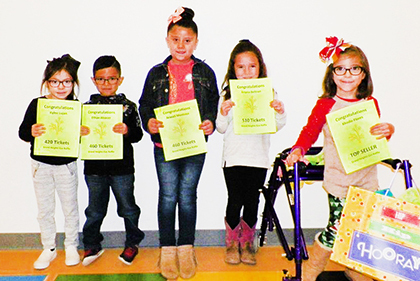 Above, Eager Beavers selling the most raffle tickets in Grand Heights Early Childhood Center’s annual Gas Raffle Fundraiser pose with their certificates. Khodie Flores, far right, was the top overall seller and won an Apple iPad. Other sellers, from left, Kylee Lujan, Ethan Alcocer, Araceli Montoya and Arina Beltran, all won Kindle Fires. The winner of the raffle for a $500 Fenn’s Country Market gift card for gas was Mary Orquiz.